Panama is one of the most biologically diverse areas in the world. Its unique ecology stems in part from its connection to the two continents that created a bridge that made it easier for animals and plants to migrate between North and South America. Scientists believe that the formation of the Isthmus of Panama is one of the most important geologic events to happen on Earth’s climate and its environment in the last 60 million years. Birds are a primary indicator of biodiversity and Panama has more species than the United States and Canada combine: it has more than 970 different birds. Panama is also privileged to be home to the Smithsonian Tropical Research Institute (STRI), a scientific investigation center, which has been cataloging and monitoring this vast ecological heritage for nearly a century. Panama offers to birders and nature enthusiast’s great opportunities to experience wildlife within short distances, involving diverse habitats in the different regions of the country, from tropical rainforest, marine coastal areas to the beautiful cloud forest in national parks and private reserves. Our expert naturalist guides are passionate about tropical Panama and will make sure you have an unforgettable experience. Our team will create a special itinerary featuring wonderful locations where you are able to enjoy first class birding and other nature activities. Can secondary forests capture carbon faster? There are an estimated five million square kilometers of abandoned farmland and logged forests in the tropics. This area, which is more than half the size of the United States, could become an important carbon sink if reclaimed by forests. Within 25 years a secondary forest can absorb as much as 80 percent of the CO2 that is held in a mature forest. Joseph Wright, a STRI forest ecologist doesn’t think that’s enough carbon, given how quickly humans are pumping it to the atmosphere. “I think we can do better,” he says. The reason is that quickly removing a large amount of carbon from the atmosphere and locking it away for centuries is not something most tree species do well. Many grow too slowly, are too small, die too young or are not dense enough to rise to the task. Doubling the amount of carbon held in a forest might be as straightforward as slightly increasing the number of fast-growing, long-lived, high density, massive individuals in it. This might not only be possible, it might also be profitable, says Wright, who is testing the thesis with a new reforestation experiment in western Panama. 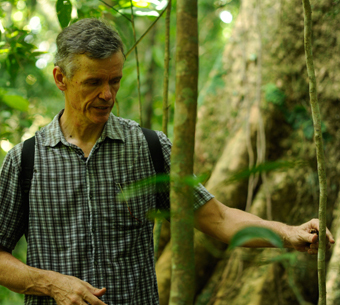 The experiment draws on 30 years of data he has collected on the life cycles of Panama’s hundreds of trees, the discount equations economists apply to carbon pricing and the latest prices for carbon offsets in Australia, Europe and British Columbia. “We’ve been studying these trees for 30 years and hopefully we’ve learned some things about them that are useful,” says Wright. Useful things include knowing what trees meet the desired criteria to manage a forest with higher-than average carbon storage: rapid growth, large mature size, and high wood density, all of which increase the amount of carbon stored by the tree. The Dipteryx and Terminalia trees Wright selected for the experiment also grow tall in full sunlight, as opposed to branching early in absence of neighboring trees. These potentially 40- to 50-meter-tall canopy giants usually rise to the canopy top late in secondary succession through gaps created by fallen trees. In mature forests, they account for a much greater percentage of stored carbon relative to their population size. In this experiment, Wright hopes to give them a low-investment head start, increasing the future mature forest’s population density of these trees as shade-tolerant trees gradually fill the understory and restore the area’s former biodiversity. “I think we can skip an intermediate step of succession dominated by smaller, trees and go straight to the 30-40-meter tall forest,” says Wright. In 2010, Wright and his team planted hundreds of Dipteryx panamensis and Terminalia amazonia trees in quarter-hectare plot pairs across 50 hectares of former grazing pasture in Veraguas province in Western Panama.”If we end up with just ten of those surviving (per quarter hectare), we will have a forest that will have twice the biomass of an unmanaged forest in Panama,” says Wright. Even if survival is only ten per hectare, the forest will hold about 40 percent more carbon than it would otherwise, says Wright, who hopes to try a similar experiment with six species with complementary resource requirements to increase the likelihood of establishing a still denser forest. Whether enough trees will survive is a question that will take many years to answer. In the higher-than-normal species density situation that Wright has created, pests might be a problem in the short-term. After two years, the plantations are doing well with the young trees up to 10 m tall and no signs of pest outbreaks. Carbon offset prices currently mandated in California, British Colombia and Australia make the enterprise profitable on otherwise abandoned lands and there are two million square kilometers of such lands in the tropics. The international community, however, lacks a mechanism to recompense governments for augmented carbon sequestration in secondary forests. Wright believes that as atmospheric CO2 concentrations and global temperatures continue to climb, this mechanism will appear.